Each and every person travelling around any area, public or private, has the need to be informed so they can pinpoint their location, know where they are and check out that area. All businesses are affected, regardless of type: trade, independent stores, large enterprises, and all private and public organisations, requiring full signage programmes to be implemented. 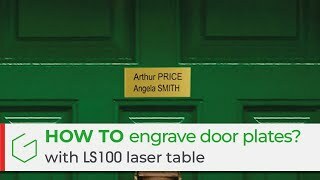 Signage throughout the entire world made using Gravograph equipment is found in the form of professional plaques, door nameplates, badges, directions in buildings, information signs in lifts, hotel signs, hospital signs, etc. Technological developments have allowed us to push the bounds of creativity in this area: Gravograph patented technology for Braille signage, Laser technology and special cutting, creative software for designing original, easily-identified and unique signs, the globally unique range of engraving material and support.